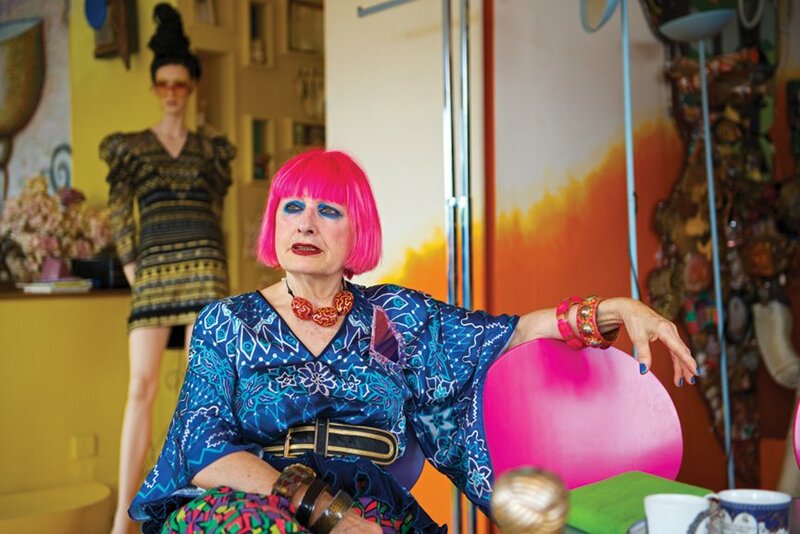 For a few weeks each month, celebrated British fashion designer Dame Zandra Rhodes lives in a home on the beach in Del Mar, works in a studio just up the road in Solana Beach and attends events all over San Diego. At 78, this bundle of energy still keeps her signature flaming pink hair, kohl-rimmed eyes, and jewelry-laden outfits intact. It’s a lifestyle more than a look. 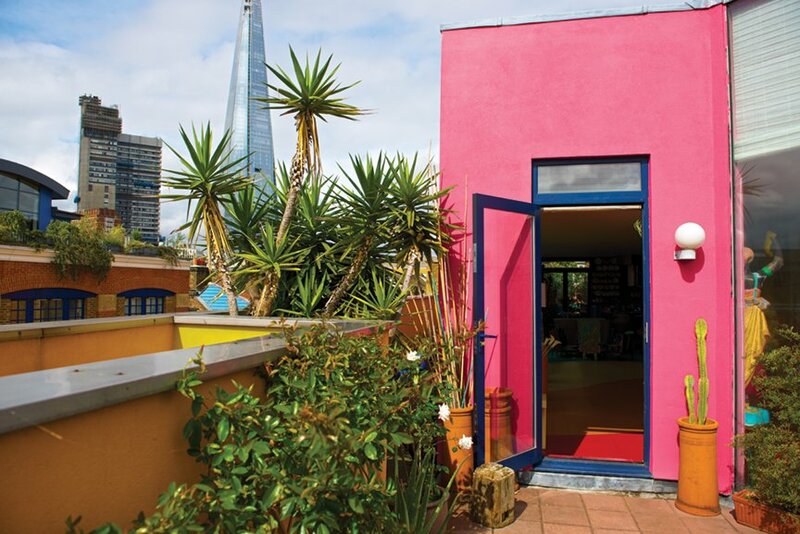 In London, where Zandra spends the remainder of each month (when she’s not traveling, of course), she owns a vibrant pied-à-terre above the Fashion and Textile Museum (FTM) that she founded and opened in 2003, and which is now part of Newham College. 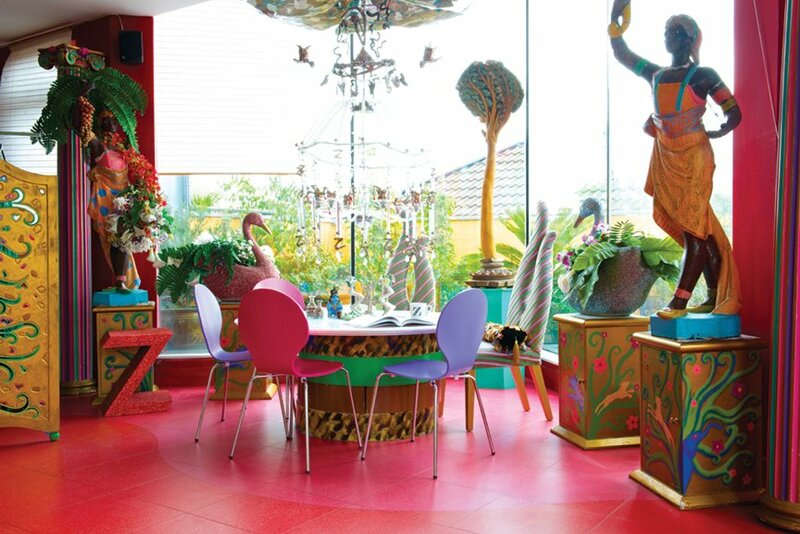 Besides the museum and Zandra’s over-the-top, two-story penthouse, the building also houses intern apartments and the print workshop and textile design studios that produce her iconic fashions and accessories. In 1995, Zandra and her longtime companion, Egyptian-born Salah Hassanein (whom she met 30-plus years ago in London when he was the head of Warner Bros. International Theatres Co.), bought what was once an old cash-and-carry warehouse in the then desolate Bermondsey neighborhood. 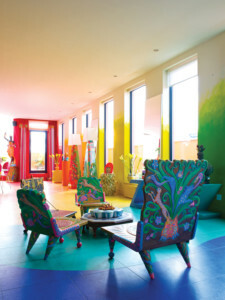 The building needed a significant overhaul, and Zandra wanted color. She also knew whom she wanted to do the transformation: Ricardo Legorreta, the Mexican architect known for his cubic structures that had stucco walls painted in striking color combinations. But when she approached him, he demurred, claiming he didn’t do remodels. 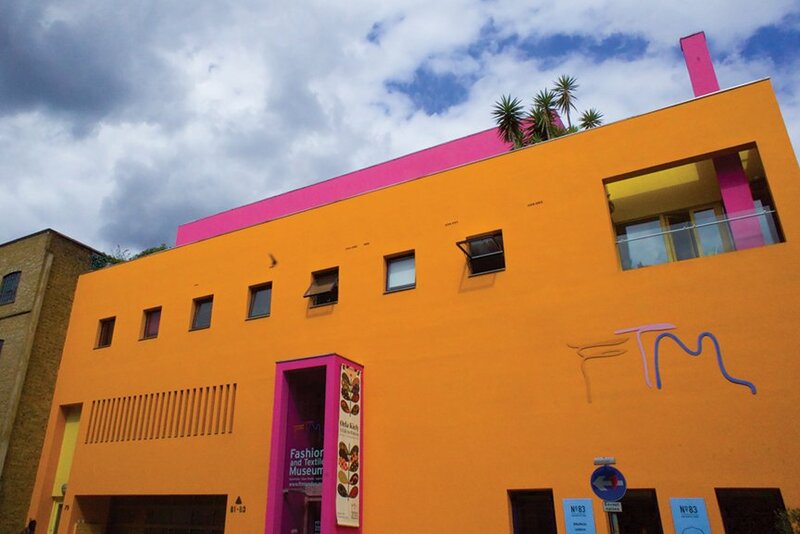 Zandra persisted, wining and dining him and ultimately, persuading him to take on the project, he re-created the structure into the orange-and-pink landmark building that’s there today. It would be one of only two designs Ricardo completed in Europe (the other is in Spain) before he passed away in 2011. The gentrified building served as the impetus for the revival of the area, named earlier this year as London’s best place to live by The Sunday Times. Zandra refers to it as “a most lovely enclave” that includes the Tate Modern and the Shard, the 95-story high-rise by Renzo Piano. Zandra’s penthouse offers a magnificent view of the skyscraper as well as sweeping London views, which she especially enjoys from her lush Frida Kahlo-blue and hot-pink walled terrace that’s thriving with camellias, fat white hydrangeas, wildflowers, a butterfly bush and rows of herbs. Inside, multifunctional living characterizes the main room, which encompasses living and dining areas as well as a tiny corner kitchen. 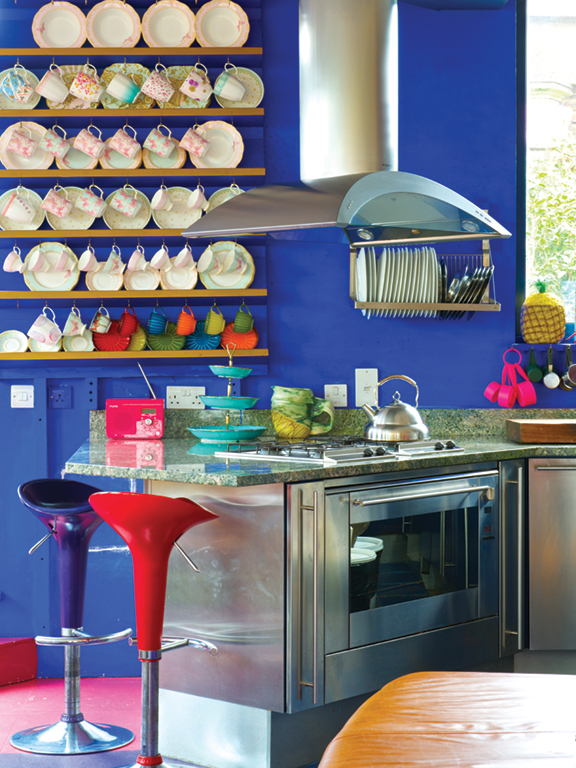 Zandra uses the space to cook for and entertain friends like actress Joanna Lumley, fashion designer Anna Sui and Princess Michael of Kent, as well as present intimate viewings of her latest collections. “Piers Atkinson, a milliner and my assistant at the time, helped me draw out the rainbow of colors on the floor,” Zandra says, and then playfully recites, “Richard of York gives battles in vain,” explaining that this is a British mnemonic for the color spectrum red, orange, yellow, green, blue, indigo and violet. The band of hues continues up the walls in an ombre motif (read how to create the on-trend ombre effect using any color on page 53) and throughout the interiors. Even the library bookshelves are color coded. Andrew Logan, a British sculptor, performance artist, jewelry designer and Zandra’s longtime friend, helped her decorate. The sparkling chandelier with tiny Zs is Andrew’s design as is the portrait bust of Zandra, the duplicate of which is in London’s National Portrait Gallery. Brooches that he and artist Duggie Fields designed are pinned in a mad collage of pattern and glitter on a large Styrofoam-covered door that’s upholstered in a printed felt. Art naturally takes a passionate role in Zandra’s decor. Behind the built-in, curved sofa sits a ledge filled with vases and other decorative pieces by British ceramicist Kate Malone and English potter Carol McNicol, among others. Behind it, two large paintings, one by Duggie Fields and the other by Andrew Stahl, hang on the wall. In the middle of the room, four low-profile chairs, which Zandra designed in India, cluster around a table that’s just inches off the ground. Folding screens, including a carved-and-painted wood one Zandra picked up in India and one that features her likeness, function like sculptures. 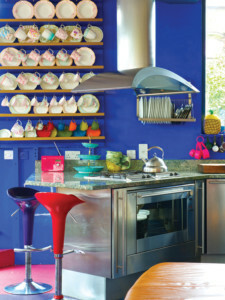 And in the kitchen, a plate rack displays the china she designed for Royal Doulton. 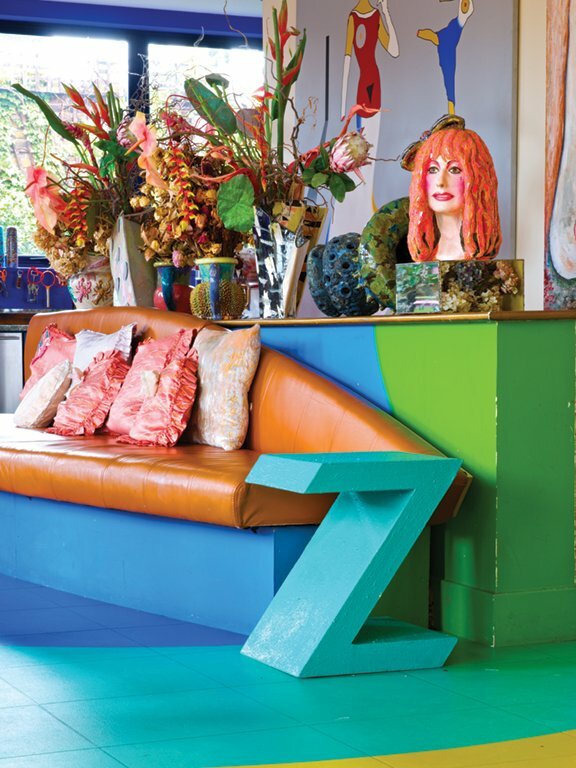 Some furnishings found new life here, such as the bright-hued Z stools, once seating options in her London boutique, which she closed in 1989, and a table she created in 1984, that she uses for dining now. Stairs lead down to Zandra’s bedroom, dressing room and bath, but the self-described workaholic doesn’t spend much time there. 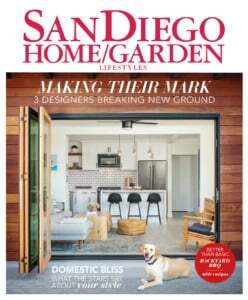 Instead—whether flying off to New York, Asia or London; doing a sketch from nature in San Diego that will find its way into her silk-screened fabrics; or cooking up a spinach soup high above London—go-go Zandra is always on the move. Currently, she’s putting the finishing touches on her next collection, which will be shown at the Westgate Hotel on the 30th of this month, and finalizing a book—that includes essays from her fashion and film-star friends—she’s releasing next year to commemorate her 50 years in business.